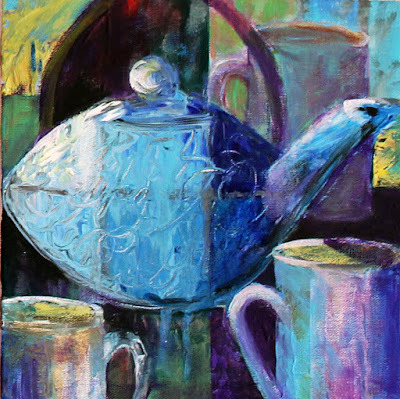 Tea with friends is on top of my list of fun things to do.Continuing my current obsession with abstraction and design i painted another still life with a teapot. Welcome to my art blog. This blog documents my journey into art. I began as a realistic painter, over the years became more impressionistic and now find myself moving towards semi abstract work. My inspiration comes from life around me, nature, city life, suburbs, people, seasons, colors and moods. I work primarily in acrylics, watercolors and oils. I have been painting from a very young age. Today, I teach adults and children in group and private lessons. I teach all mediums and all genres of art. I also conduct Paint Alongs for adults and children throughout the year. I am an active member of several local art societies and organizations and have participated in many group and solo shows. Welcome to my art blog. This blog documents my journey into art. I began as a realistic painter, over the years became more impressionistic and now find myself moving towards semi abstract work. My inspiration comes from life around me, nature, city life, suburbs, people, seasons, colors and moods. I work primarily in acrylics, watercolors and oils. I have been painting from a very young age. Today, I teach adults and children in group and private lessons. I teach all mediums and all genres of art. I also conduct Paint Alongs for adults and children throughout the year. I am an active member of several local art societies and organizations and have participated in many group and solo shows.